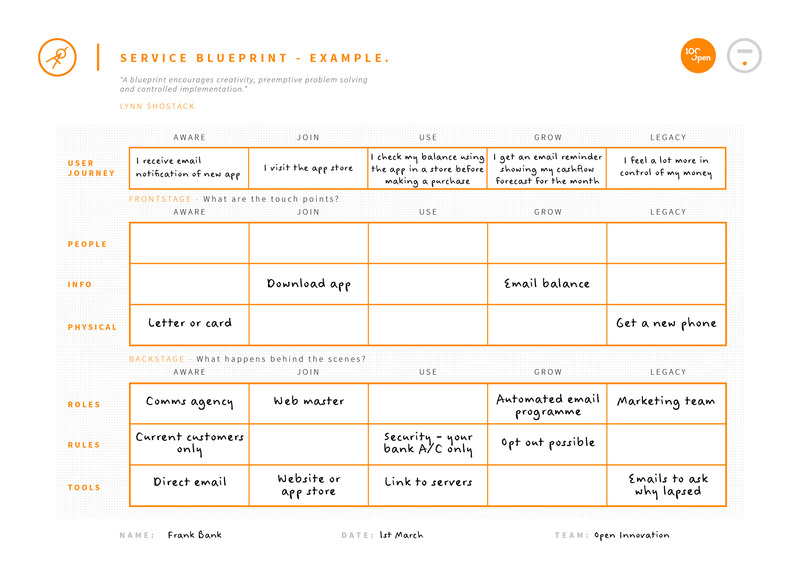 The Service Blueprint tool breaks down a new product or service into its component parts and helps us think systematically about creating a valuable and connected user journey. A Service Blueprint is a template for the delivery of the physical and informational aspects of a service innovation as well as the people, rules and tools needed to deliver it successfully. "A blueprint encourages creativity, preemptive problem solving and controlled implementation." Each of these 5 steps can be examined from the two points of view; Front Stage and Back Stage. 1. Front Stage. What are the touch points? This maps and details a user’s experience over time as they interact with three different aspects of a product or service called touchpoints. Each touchpoint can be prototyped. Touchpoint 3: Encounters with people e.g. speaking to the receptionist on the phone to book an appointment, your greeting at reception, the doctor’s bedside manner. 2. Back Stage. What happens behind the scenes? We turn our focus to the infrastructure, materials and behaviours that need to happen behind the scenes in order for our new product, service or process to work. What roles will people have to play to deliver a service? What rules are there at different stages of the process? What tools are needed at each stage? Finally, on the tool we can circle any elements that are weak or untried and that we need to prototype. 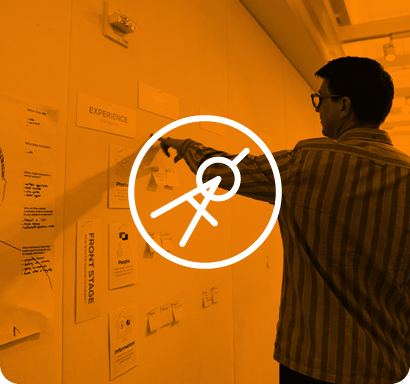 Use the Service Blueprint in an Ideas Jam for developing new service propositions. Bring different parts of the service proposition to life in conjunction with Sketch Templates and Idea Frame.